“Someone must say the unsayable!” protests Margaret Thatcher during her campaign in The Iron Lady. Thatcher’s attitude applies to this year’s campaign for Best Actress as well. As The Iron Lady, Meryl Streep gives one of her most impressive performances, turning one of the most volatile, most controversial figures of the Twentieth Century into a genuinely fallible and sympathetic character. It’s no small feat, and that’s why it’s the crowning achievement of one of the strongest Best Actress line-ups ever, with Glenn Close, Viola Davis, Rooney Mara, and Michelle Williams deservedly vying with Streep for the prize. Rather than debate the pros and cons of each performer and her respective film, though, one must make a case for Meryl Streep. In what also looks to be the most competitive and most emotionally charged race I have seen since I began following the Oscars, Streep deserves a victory. Some say that Streep will/should not win because The Iron Lady lacks the pedigree one expects of a film bearing the title “Best”. I sympathize on the latter, but not on the former. The Iron Lady is, by all regards, a flawed film. It creates a “greatest hits” biopic narrative by simplifying some sensitive politics and by generating some positive spin on troublesome moments of Thatcher’s career. As I said in my original review, though, and will say again, such choices are inevitable in making a biography, and The Iron Lady by no means ignores the damage wrought by Thatcherism. It is, however, unfair to allow the lesser quality of a film detract from the merit of its lead performer. In virtually every review that one reads for The Iron Lady, positive or negative, one sees some form of endorsement for the film based on Streep’s performance. In spite of all the faults of The Iron Lady, Meryl Streep’s performance as Margaret Thatcher makes the film worth seeing. This is the hallmark of a great performance. To transform herself fully as Margaret Thatcher, Streep once again undergoes a physical transformation, donning a new hairdo and gobs of make-up. She offers another of her uncannily spot-on accents as well, capturing Thatcher’s British idioms – in two octaves, no less – just as well as she did Sophie’s mix of Polish and broken English in Sophie’s Choice or the Italian lilt that made Francesca an outsider in The Bridges of Madison County. As with all the precedents on her résumé, Streep delves fully into the persona of her role not merely to offer perfect mimicry, but rather to exploit such traits and deliver a unique, fully realized character. One could argue that the spirit and playfulness Streep exudes do not bear complete fidelity to her real life counterpart, but this is, after all, a performance. In her performance as Thatcher, Streep demonstrates a masterful grasp of the mechanics of acting and combines them with artistic invention in order to create a character who evokes its inspiration, but also one who commands attention from the audience. Perhaps this trademark of Streep’s craft is what makes The Iron Lady so watchable in spite of the defects of the film itself. Never before has Streep so greatly raised herself above the material she was given. So much of the film’s substance comes from the emotion generated by her performance. Whereas the film glosses over the negative aspects of Thatcher’s career – aside from snippets of archival footage – Streep’s performance grounds Thatcher’s tyranny in reality. 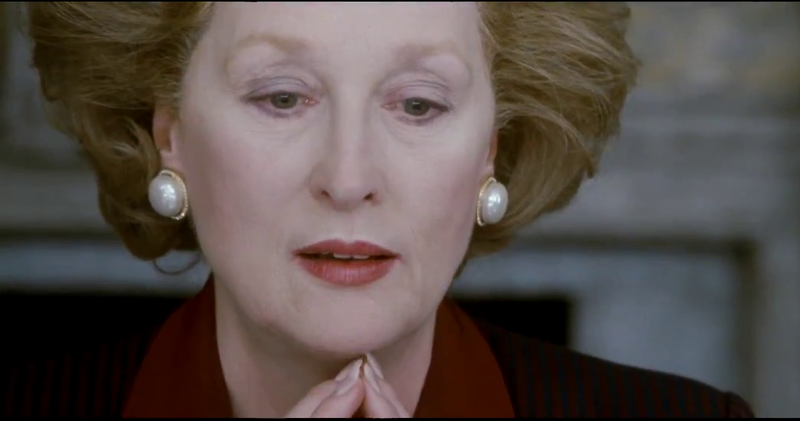 Witness the scene in the latter half of the film in which Thatcher loses her cool and chastises her colleagues: Streep’s darting eyes and furrowed brow create a woman undone by power. In this one scene, Streep suggests that Thatcher’s stubbornness, arrogance, and ambition ultimately brought her downfall. Streep does not waiver when the time comes to offer a critique of her character, and The Iron Lady is so much the better for it, as Streep appropriates the complexity of Margaret Thatcher and still implores viewers to appreciate the psyche of this controversial icon. Where the film is shy, Streep is not. Streep has made a career out of bravery. Few actresses have reinvented themselves as frequently as she has, and even fewer have pushed themselves to such great lengths. It is no wonder that Streep is once again in contention for an Oscar. She deserves it. If anyone seeks proof as to why Meryl Streep is the greatest actress who ever lived, look no further than her laudable ability to save The Iron Lady from the bargain bin and bring it straight to the Kodak Theatre.